Some of the most innovative and provocative work on the emotions and illness is occurring in cross-cultural research on depression. 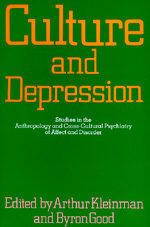 Culture and Depression presents the work of anthropologists, psychiatrists, and psychologists who examine the controversies, agreements, and conceptual and methodological problems that arise in the course of such research. A book of enormous depth and breadth of discussion, Culture and Depression enriches the cross-cultural study of emotions and mental illness and leads it in new directions. It commences with a historical study followed by a series of anthropological accounts that examine the problems that arise when depression is assessed in other cultures. This is a work of impressive scholarship which demonstrates that anthropological approaches to affect and illness raise central questions for psychiatry and psychology, and that cross-cultural studies of depression raise equally provocative questions for anthropology. Arthur Kleinman is a prominent American psychiatrist and is the Esther and Sidney Rabb Professor of medical anthropology and cross-cultural psychiatry at Harvard University. Byron J. Good is Professor of Medical Anthropology in the Department of Social Medicine at Harvard University.